Designed for Junior between 6-12 years old. Designed for older children with a mixture of first and permanent teeth. CrissCross bristles effectively remove plaque. 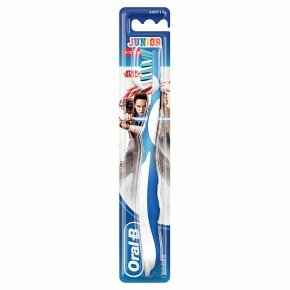 Brush handle non-slip, comfort grip designed for 6 to 12 years.The Oral-B Junior manual toothbrush featuring Star Wars Characters is specifically designed for children between 6 to 12 years old. Its CrissCross bristles effectively remove plaque.